Hi friends! It's Sunday and that means time for a new challenge at The Paper Players! This week the amazing Jaydee is our hostess with a fun Tic Tac Toe challenge. 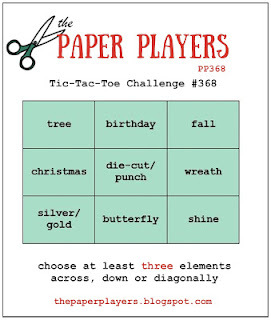 My card goes down the left side of the tic-tac-toe board: Tree, Christmas, Silver/Gold. 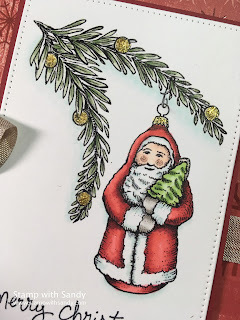 I used a new digi stamp set from Power Poppy, and love this vintage German style ornament, just like the ones my parents used to have. I added a sentiment from a retired Stampin' Up set as I thought the font worked nicely, then colored my image with Copics. The little balls on the tree and the ornament hanger are my gold elements, and though I couldn't capture it well they are sparkly IRL. While I was at it, I made two! My Christmas card stash is steadily growing. Beautiful coloring! 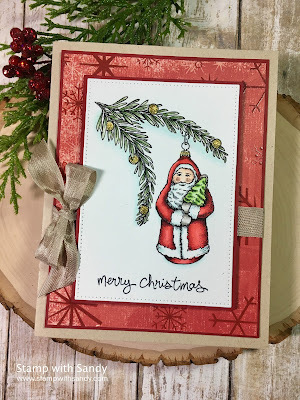 Love the soft, vintage look of the distressed paper with crumb cake. Your composition is perfectly balanced--fabulous card, my friend! That is such an AWESOME image...I love that Santa ornament. Love how you colored it,too! 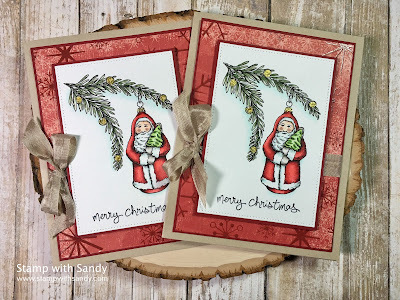 I love these little Santas...and I still have some to hang on my tree!! Love the gold ornaments, too! That is a wonderful image! And I love the papers you behind him. Your card this week is so sweet Sandy - I'm sure my parents have an ornament like that on their Christmas tree too! I love the little gold baubles and the patterned border - the perfect way to highlight your ornament and expert colouring. Super elegant and vintage-y all wrapped into one - LOVE!!! Sandy, I love this little santa. He reminds me of the advent chocolates I used to be allowed when I was a child. One every night for the lead up until Christmas. Thank you for that wonderful memory! I agree with Claire, your coloring is fabulous, too!